Today is a snow day and working from home means no commute and extra time under the covers. Parenthood means the exact opposite, of course. Kamran was exploring this morning but let us stay in bed for an extra few minutes. SO NICE! Our boy is growing up. 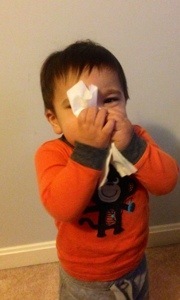 This morning Kamran found tissues–a toddler’s favorite mess to make. He said, “nose? !” Meaning he wants to blow his nose. I asked my husband to help him because unassisted nose blowing means a mess. Before he could get to the tissue-laden toddler, he was done blowing his nose and saying “trash” headed to the trash can. Guess he doesn’t need us anymore! 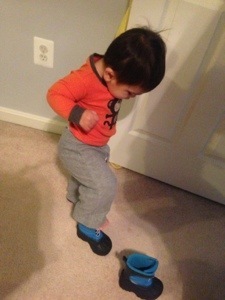 He also found his snow boots in our closet and insisted they go on his feet. I guess he does fully comprehend what snow means! I haven’t updated in a few weeks so…Kam is a total blabber mouth and it’s super fun. He is king of repeating the same word 5 times before you have a moment to respond. Lots of his words sound like bad words but aren’t. We had Kamran’s final NICU follow along 2 weeks ago, the speech pathologist said he is right on track for a 2 year old on speech development. Same goes for other development areas as well. We are so lucky and happy about that! He should start stringing more words together soon. Oh, and no more adjusted age! Have a fun snowquester/snowquestration today everyone!